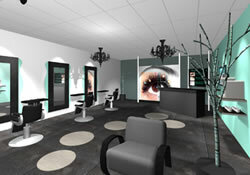 If you are looking for information on the Brow Art 23 franchise business opportunity, Brow Art franchises or Brow Art 23 franchising, then you have come to the right place. Welcome to Brow Art 23! Brow Art 23 offers a franchise in the Ancient Art of Eyebrow Threading, permanent makeup, eyelash extensions, Henna, and other facial services and products. We offer complete training on all of our techniques. While some of our owners will be owner/operators, we invite owner/managers and absentee owners. 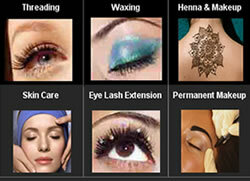 For hundreds of years, eyebrow threading has been one of the best kept beauty secrets in the world. While there are small owner-operators in the United States, Brow Art 23 is the first nationally branded business of its kind. 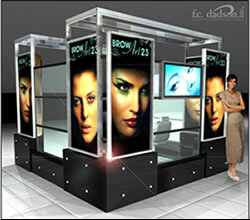 As you can see by our beautifully designed mall kiosk and inline stores, Brow Art 23 is setting the standard for this industry. Join us in this multi-billion dollar beauty industry that is recession resistant and offers repeat customers. Customers return as often as every three weeks because it is affordable, fast and most of all painless! Our Threading Artists, in as little as 10 minutes and for as low as $10 ($25 average), can transform a client's appearance. Some clients come by before a party or special event because our services are so quick and easy to obtain. There are no appointments. Our exclusive Brow Art 23 product line is in high demand by our customers and will add additional profits to the bottom line. Threading Artists can be hired in almost any market and are often licensed estheticians or cosmetologists who have completed our specialized training and we have certified them as Threading Artists. The size of your market and the location will determine how many stations you need. For many markets our Kiosk solutions can offer two or three stations. Many of our franchisees are multi-unit owners and we encourage development of entire market areas. We have corporate stores in many markets, some corporate stores are available for conversion to franchises. We have retained the professional services of FranchiseInc! to help you qualify to be one of our franchisees. Additionally, we have negotiated some of the top mall locations nationwide and it is possible to be open in as little as 30 days. While we do not offer corporate financing, there are several lenders who have indicated they would lease the fixtures, etc. for candidates with qualifying credit.